If you haven't already noticed, it's hot out there—and I mean really hot. We're talking makeup-melting, fanning-yourself-with-the-contents-of-your-desk-drawer hot. Usually this sort of extreme weather means that practicality is pushed to the forefront: What will hide sweat patches? What won't stick to other people on the tube? But not for this stylish lot. 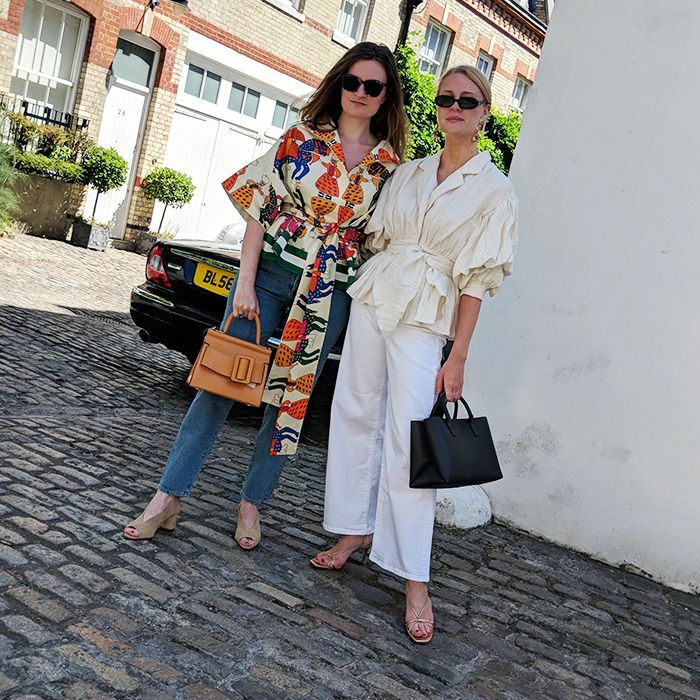 We've been scouring the streets of London to find the best hot-weather outfits as worn by you, the Great British public. You didn't disappoint; from killer accessories and stylish skirts to an impressive lineup of vintage showstoppers, this is Heatwave Dressing 101. Scroll down to discover the looks we've fallen in love with. And if you spot yourself, don't forget to give us a wave on Twitter or Instagram! Style Notes: Tour guide Sara gives us a lesson in high/low dressing with this floaty H&M dress don't-mess-with-me Doc Martens. Style Notes: We have hot-weather outfit envy with Victoria's effortless ensemble. Her instantly recognisable Chloe mini bag is framed perfectly by a red miniskirt and white tee. Not to mention those chunky trainers—swoon. Style Notes: Shan's silky shirt looks cool (in every sense of the word) knotted over straight-leg jeans, while her Furla bag is a cute colour-matching addition. Style Notes: Floral ASOS dress, Moschino crop top and YSL gold boots? Be still, our beating hearts. Curator Maxine certainly knows how to make eclectic combos work. Style Notes: We love a good printed skirt here at Who What Wear, and this knee-grazer from Zara (where else?) is simply asking to be worn on a sunny Saturday. Note how the wide strap of the Marc Jacobs bag adds interest up top. Bravo, Jency. Style Notes: Elija is channeling some serious flamenco-girl emoji vibes in this vibrant outfit (in the best way possible). The red wrap top is so flattering with the poppy-printed skirt, which hits the knee at just the right point. Style Notes: Who knew a white denim mini and black tube top could make such an impact? DJ Dina, apparently. The addition of transparent mules and ankle socks is a surefire way to make any outfit look instantly more fashion forward. Style Notes: Print designer Hannah reveals her style credentials in this chic vintage dress. She keeps her accessories simple to let the frock do the talking. Style Notes: Student Yato proves that heritage fabrics needn't be constrained to the winter months. This girl knows how to accessorise, and we're going to be copying her knotted-scarf-as-a-belt styling trick—oh, and lusting after that Gucci bag. Style Notes: Savannah presents another winning heatwave look with this vintage button-up dress and Topshop sandals. Summer in the city, sorted. Style Notes: Fausta dazzles in yet another vintage showstopper (London girls sure know how to thrift). She dials down the blazer's razzmatazz with a pair of androgynous black trousers but adds shape with a cinching belt. Up next: The affordable brands I'm shopping instead of Zara right now.